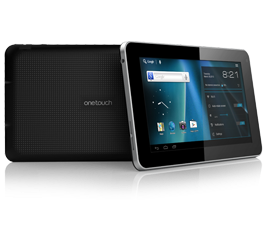 Alcatel has today announced it's first tablet from the company, namely One Touch T10, which features 7 inch screen, 1 GHz Cortex A8 processor and Android 4.0.3 (Ice Cream Sandwich) operating system. The tablet comes with 7 inch TFT display screen that supports 800 x 480 pixel resolution, 16:9 aspect ratio and weighs 340g. One Touch T10 powered by 1 GHz Cortex A8 processor, 1 GB of DDR3 RAM and drains energy from a 3000 mAh battery.